Everyday objects and life forms, magnified hundreds, thousands, even tens of thousands times, what would you see? 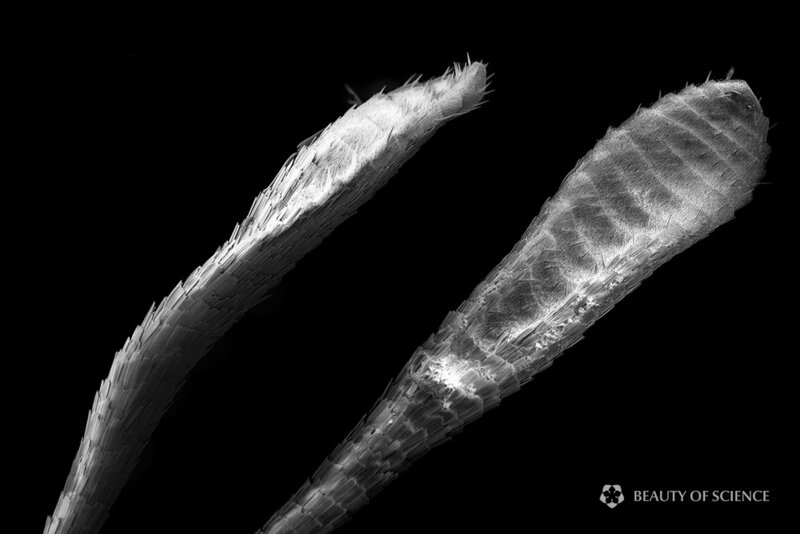 That's what we want to show in Microworld Unseen, a new project from Beauty of Science, in which we use a scanning electron microscope (SEM) to explore the microscopic world and discover extraordinary and beautiful sceneries within ordinary objects and life forms. 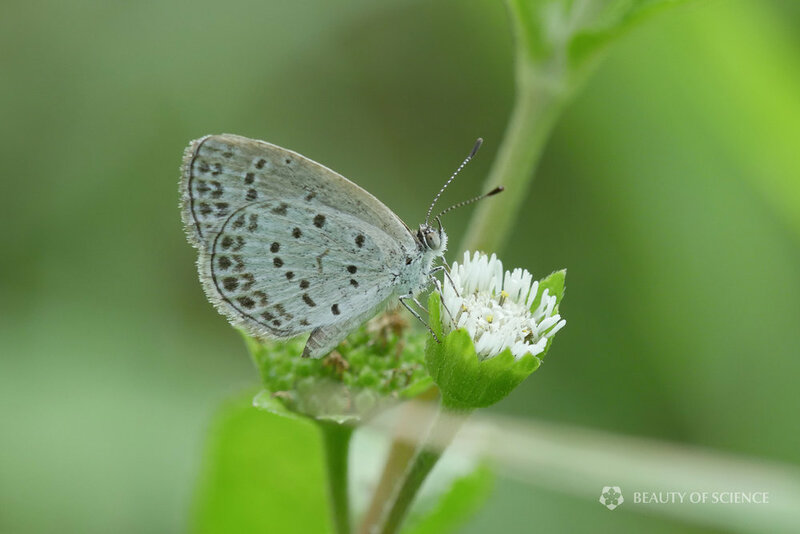 The pale grass blue (Pseudozizeeria maha) is a common butterfly found in Asia. It is small and has a quite ordinary look. As a result, you probably have seen them flying around near wild flowers before, but very likely, you have paid little attention to them. Their ordinary look is the reason why we decided to take another good look at them with a scanning electron microscope (SEM). One hidden feature revealed: the body of this little creature was covered with different kinds of scales everywhere you look. 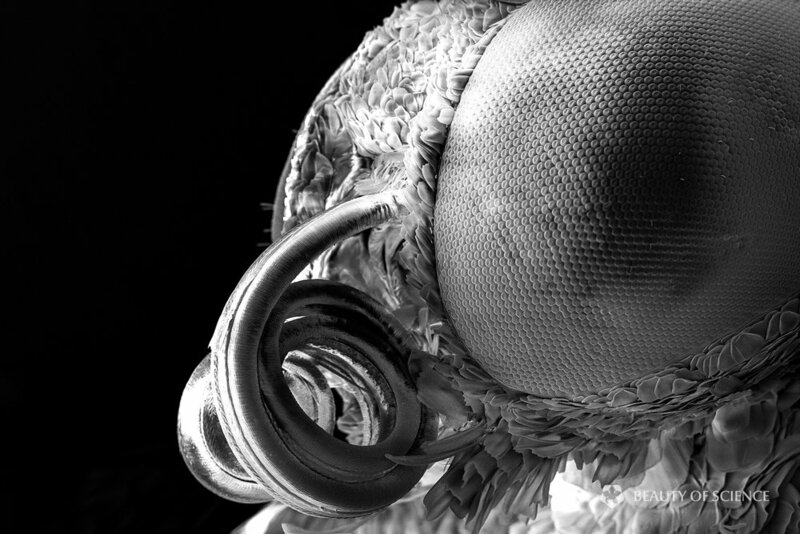 Seeing under the electron microscope, the compound eye of the pale grass blue is like an alien planet. The eye is made of tens of thousands of ommatidia, which help the butterfly to generate an almost 360 degree mosaic view of its surrounding. Each ommatidium is a long rod going inside the eye. In the images below, the hexagons are lenses (corneas) at the top of the ommatidia. Just like we use straws to drink soda from cups, a pale grass blue uses its proboscis to drink nectar from flowers. However, unlike simple plastic straw, the proboscis has much more complicated structures. Some of the structures might enable the butterfly to control the coiling and uncoiling of the proboscis. A pale grass blue uses a pair of antennae to sense chemical signals, which helps it to find food or a mate. The antenna is cylindrical in the middle, covered with scales. At the tip, the antenna becomes bigger and flatter, covered with dense small hairs and sporadic spike-like scales. Would the hairs enhance chemical sensing ability due to their larger surface area? What are the function of the spike-like scales? An unexpected discovery is that the legs of a pale grass blue are covered with scales as well, like armor plates. However, their protective function is in doubt as many of them easily fell off, revealing the holes that the scales were originally attached to. The image below looks like a strange bird, with beautiful feathers around its neck. 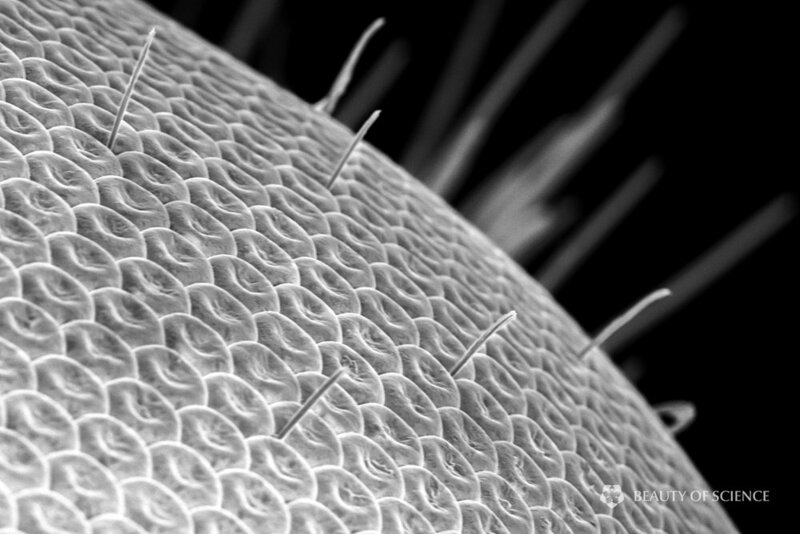 But actually, these complicated structures are the genitalia at the end of the abdomen of a male pale grass blue. The scales around the genitalia are also unique. You probably know that butterfly wings are covered with tiny scales, but you might not know that the scales from different parts of the wings are quite different. Showing below are scales from the center of the wing, the top edge of the forewing, and bottom edge of the hindwing of a pale grass blue.